Last year brought what seemed like a disturbing omen to communities surrounding Europe’s North Sea: a whole lot of beached sperm whales. As Gizmodo reported at the time, the whales entered the sea’s shallow waters, where their internal sonar-like systems stopped working, causing them to become stranded and die. But scientists didn’t know why the whales entered these dangerous shallow waters in the first place. A new team has come up with a cosmic hypothesis for the mysterious beachings: Perhaps the whales got stranded after trying to navigate using the Earth’s geomagnetic field during a solar storm. The Sun could have broken the whales’ GPS. 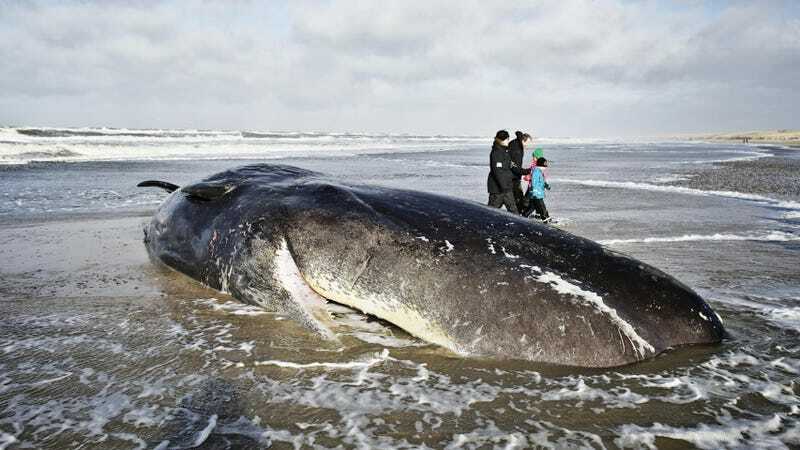 Mass sperm whale strandings have been recorded since the Middle Ages, but Vanselow was specifically interested in one that occurred in the winter of 2016, when 29 male sperm whales washed ashore in Germany, Britain, France and The Netherlands. Autopsies revealed that the whales were all healthy aside from some debris in nine of their bellies, not enough to kill them. Vanselow realized that many animals, including cetaceans, navigate via the Earth’s magnetic field (he has studied the effect of magnetic anomalies on whale behavior in the past). The team collected data on the magnetic field’s strength and the angles it made with the Earth, and noticed that just before the strandings began, some measuring stations recorded magnetic field changes from solar storms, flares of particles blasting off of the Sun and streaming at Earth. He and his co-authors published their findings in the International Journal of Astrobiology last month. The timing of a strong solar storm prior to the whale beachings led the researchers to a hypothesis. While female sperm whales remain closer to the equator to raise their calves, males swim north to feed. Perhaps, then, the males adapt to a quieter magnetic field in those more equatorial waters, making them susceptible to random and large magnetic field fluctuations from solar storms they face further north. As the BBC notes, this paper merely offers a plausible explanation and a hypothesis about a single event that would be difficult to prove. There are plenty of other factors to take into account, such as increased whale populations due to decreased whaling pressure, earthquakes, boats and oil development. “It would be difficult to say that ‘yes this was the cause’, we would be cautious in saying that,” Abbo Van Neer from the University of Hannover, who performed some of the whale autopsies, told the BBC. “But it is a valid hypothesis and a potential reason for the stranding.” I have reached out to other researchers for further comment. So, next time you hear about an incredibly powerful aurora borealis, keep your eyes open. You might spot some lost whales.